NASAThis image, taken by a NASA satellite last Thursday, shows Nuri heading for Alaska’s Aleutian Islands. The northern United States will get a blast of unseasonably cold weather this week, thanks to what has been terrifyingly dubbed a “bomb cyclone,” caused by a record-breaking “monster storm” in Alaska. This can happen when an existing storm runs into another weather system and gains some extra energy, intensifying in the process. A weather system in the Bering Sea met the “bomb” criteria and then some over the weekend, when remnants of Super Typhoon Nuri, one of this year’s most powerful tropical cyclones, rammed into the polar jet stream over the weekend. 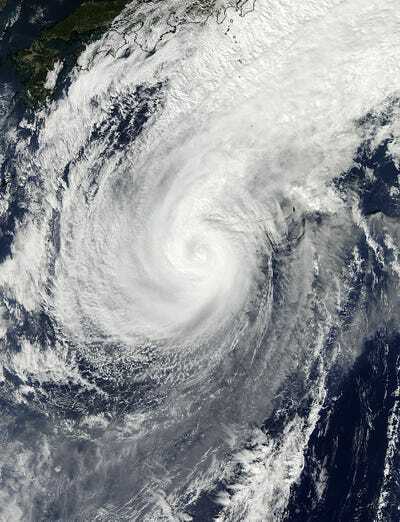 The extra energy from this collision pushed the previously-weakened Nuri to quickly intensify, causing a rapid drop in pressure, as well as hurricane-force winds and massive waves, in the Bering Sea. That’s the “bomb” in bomb cyclone. Low-pressure systems caused by these “bomb cyclones” cause air to rise, allowing water vapor in the air to condense and form clouds. This is why low-pressure systems are commonly associated with storms. The cyclone ripped through parts of Alaska’s Aleutian Islands over the weekend, and while the now-weakening storm will peter out over the next few days, it caused enough of a disturbance in the Arctic to kick a stream of frigid air south to Canada and the continental United States — air from the dreaded polar vortex. The cold air, which is currently hitting the Northern Plains and is now travelling east across the country, came from the polar vortex, a spinning system of frigid winds circling the Arctic. The polar vortex is a normal, seasonal occurrence in the Arctic, but disturbances like this “bomb cyclone” can kick some of that cold air down through North America and cause drastic cold spells. Residents of the northeastern US will remember last year’s disturbed polar vortex, which made news by sending Arctic-calibre temperatures ripping southward. This week, NOAA predicts the northern US will get another taste of those chilly conditions as the Arctic air barrels eastward across the top half of the country. The cyclone won’t be coming with it — it was already moving out into the central Bering Sea as of last night — but the cold air will bring its own problems. The graphic below, made from maps created by NOAA, shows temperatures dropping across the country throughout the rest of the week (through Sunday Nov. 16) as the system as the system moves east. The purple colours are below freezing. Today, the National Weather Service predicts temperatures in the Northern Plains will drop 20 to 30 degrees Fahrenheit below their average levels. By tomorrow night, the storm is expected to move east, bringing snow to the Northern and Central Rockies, the Great Lakes region, and the upper Mississippi Valley, as show in the graphic below. The National Weather Service reports that parts of Minnesota, Wisconsin, and Michigan could get more than a foot of snow. Meanwhile, the Gulf Coast and the Southeast will get a series of showers and thunderstorms. Residents of the northeast may experience flashbacks to last winter’s polar vortex, which sent frigid temperatures ripping down the east coast. Fortunately, NOAA has predicted a milder winter for the eastern seaboard this year — but this week, the US’s northern states can strap in for an early cold snap.